Polyarteritis Nodosa; Vasculitis; Polyneuropathies; Cyclophosphamide. Necrotizing vasculitic neuropathy in polyarteritis nodosa can rarely present acutely and may mimic acute inflammatory neuropathies. A 53-year-old male presented with an acute neurological illness characterized by paresthesia and weakness of both lower limbs lasting six-days. He also had mild paresthesia of both hands. On examination, there were confluent, purpuric, and ecchymotic patches over the extensor aspects of both lower limbs, which were palpable. Neurological examination revealed grade II/V power with hypotonia and absent reflexes in the lower limbs. All modalities of sensation were decreased below the knee. Sensory impairment was also noted on the fingertips of both hands. Nerve conduction study suggested an asymmetrical sensorimotor axonal neuropathy. Sural nerve biopsy was consistent with necrotizing vasculitis. He was treated with intravenous methylprednisolone followed by oral prednisolone and monthly cyclophosphamide injection for six-months and made a good recovery. 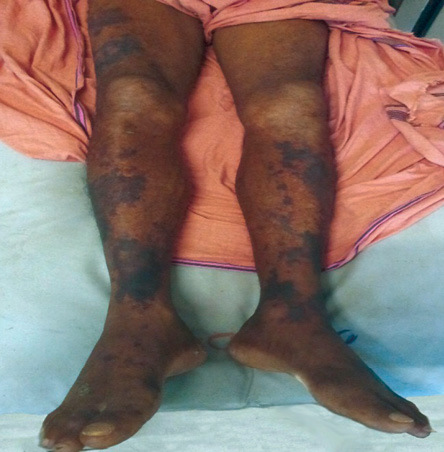 A 53-year-old male presented with an acute neurological illness characterized by paresthesia and weakness of both lower limbs of six-days duration. He also had mild paresthesia of both hands, but no upper limb, trunk, neck, or bulbar muscle weakness. He gave a history of right-sided testicular pain two weeks prior, which subsided with conservative treatment. He had no history of joint pain, photosensitivity, dryness of eyes or mouth, oral or genital ulcers. He had no history of hypertension or diabetes mellitus. On examination, his blood pressure was 150/90 mmHg. There were confluent, purpuric, and ecchymotic patches over the extensor aspects of both lower limbs, which were palpable [Figure 1]. Neurological examination revealed grade II/V power with hypotonia and absent reflexes in the lower limbs. All modalities of sensation were decreased below the knee. Sensory impairment was also noted in the fingertips of both hands. Investigations revealed a white blood cell count of 25 400/mm3 with 84% polymorphs, 6% lymphocytes, and 9% mixed cells. His erythrocyte sedimentation rate (ESR) was 106 mm in the first hour. His blood urea was 27 mg/dL, serum creatinine 0.8 mg/dL, and urine protein creatinine ratio was 0.25 (normal < 0.15). Urine microscopy showed no sediments. His blood sugar was 134 mg/dL and glycated hemoglobin level was 5.4%. Antinuclear antibodies, antineutrophilic cytoplasmic antibodies, urine porphobilinogen, serum protein electrophoresis, rheumatoid factor, cryoglobulins, HIV, hepatitis B surface antigen, and hepatitis C antibody serology were negative. Chest X-ray and ultrasound of the abdomen were normal. Magnetic resonance imaging of the spinal cord and cerebral spinal fluid (CSF) study were also normal. Nerve conduction study, done using supramaximal stimulation showed reduced compound muscle action potential from right median nerve and both ulnar nerves with absent response in both tibial and common peroneal nerves. Sensory potentials were reduced in both ulnar nerves and were not elicitable from sural or peroneal nerves in both lower limbs. These were suggestive of an asymmetrical sensorimotor axonal neuropathy. Sural nerve biopsy revealed concentric thickening of epineural medium-sized and large arterioles with focal fibrinoid necrosis, transmural inflammation, and uniform axonal loss with focal axonal breakdown consistent with necrotizing vasculitis. He was treated with intravenous methylprednisolone 1000 mg pulse for three days, followed by oral prednisolone at 1 mg/kg and monthly cyclophosphamide injection 500 mg/m2 for six-months. He was maintained on azathioprine with low dose prednisolone. At follow-up, after 10-months, he made good recovery and was able to walk with support. Figure 1: Palpable purpura and ecchymosis over the extensor aspect of thighs and legs. Necrotizing vasculitis is a distinct subtype of vasculitis with inflammation and fibrinoid necrosis of the vessel wall. It is seen in PAN, microscopic polyangiitis, Wegener’s granulomatosis, Churg-Strauss syndrome, and secondary vasculitis due to rheumatoid arthritis or Sjogren’s syndrome.2 Peripheral neuropathy occurs in vasculitis due to involvement of the vasa nervorum causing nerve ischemia and axonal breakdown. Neuropathy in necrotizing vasculitis may present as mononeuritis, mononeuritis multiplex, or asymmetric polyneuropathy (confluent neuropathy).3 Symmetrical polyneuropathy is also described. Vasculitic neuropathies are usually subacute or chronic. Rarely, they can present acutely and may mimic acute inflammatory neuropathies as in our case.4 Clinically, acute necrotizing vasculitic neuropathy and acute inflammatory demyelination polyradiculoneuropathy (AIDP) present similarly with symmetric sensorimotor weakness. CSF study in AIDP usually shows elevated protein with normal cell counts (albuminocytological dissociation), which is absent in vasculitic neuropathies. During the acute phase before the stage of axonal degeneration, nerve conduction study in necrotizing vasculitis may show a pseudo conduction block adding difficulty in differentiating it from inflammatory neuropathies.5 As the axons undergo Wallerian degeneration, an axonal pattern eventually emerges. In our case, the nerve conduction study showed an axonal pattern as it was done one-week after the onset of illness. The palpable purpuras, testicular pain, and the high ESR in our case were other clinical clues suggesting a vasculitic process. Testicular pain in PAN is due to orchitis and indicates testicular vasculitis.6 In doubtful cases, a nerve biopsy should be done and will demonstrate the vasculitis of the vasa nervorum. Immunosuppressants are the mainstay of treatment of PAN along with antiviral treatment in hepatitis B positive cases. A mild disease like isolated cutaneous involvement, polyarthralgia or constitutional symptoms is treated with glucocorticoids alone. Those with involvement of any major organs like kidney, secondary hypertension presumed due to renal vasculitis, arterial stenosis or aneurysms, cardiac, or nervous system involvement are said to have severe disease. These patients require aggressive immunosuppression with glucocorticoids plus cyclophosphamide.7 As our patient had acute vasculitic neuropathy and early renal involvement as evidenced by proteinuria with new onset hypertension, he was treated with glucocorticoid and cyclophosphamide. The prognosis of PAN is good with early and appropriate therapy. Our patient had good recovery from a bedridden state to an ambulant condition after a six-month course of cyclophosphamide with glucocorticoids. Acute weakness can rarely be due to necrotizing vasculitic neuropathy. It can mimic other acute inflammatory polyneuropathies like Guillain-Barre syndrome. Vasculitic neuropathy should be considered if there are other features of systemic vasculitis like a purpuric rash or high ESR. Nerve conduction study cannot distinguish between these entities, and a definite diagnosis requires nerve biopsy. Aggressive immunosuppression usually leads to good improvement. 1. Ng KK, Yeung HM, Loo KT, Chan HM, Wong CK, Li PC. Acute fulminant neuropathy in a patient with Churg-Strauss syndrome. Postgrad Med J 1997 Apr;73(858):236-238. 2. Said G, Lacroix C. Primary and secondary vasculitic neuropathy. J Neurol 2005 Jun;252(6):633-641. 3. Said G, Lacroix-Ciaudo C, Fujimura H, Blas C, Faux N. The peripheral neuropathy of necrotizing arteritis: a clinicopathological study. Ann Neurol 1988 May;23(5):461-465. 4. Riva N, Cerri F, Butera C, Amadio S, Quattrini A, Fazio R, et al. Churg Strauss syndrome presenting as acute neuropathy resembling Guillain Barré syndrome: case report. J Neurol 2008 Nov;255(11):1843-1844. 5. Jamieson PW, Giuliani MJ, Martinez AJ. Necrotizing angiopathy presenting with multifocal conduction blocks. Neurology 1991 Mar;41(3):442-444. 6. Teichman JM, Mattrey RF, Demby AM, Schmidt JD. Polyarteritis nodosa presenting as acute orchitis: a case report and review of the literature. J Urol 1993 May;149(5):1139-1140. 7. De Virgilio A, Greco A, Magliulo G, Gallo A, Ruoppolo G, Conte M, et al. Polyarteritis nodosa: A contemporary overview. Autoimmun Rev 2016 Jun;15(6):564-570.